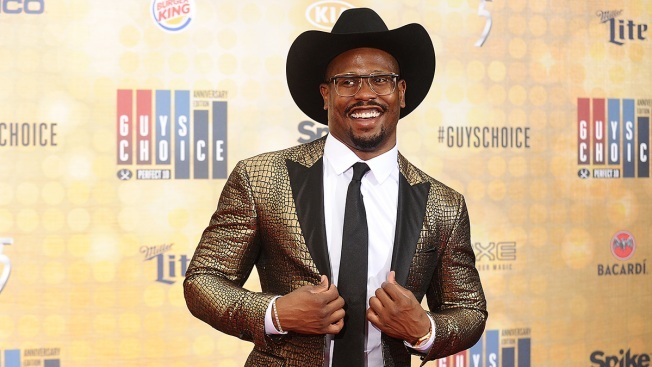 NFL player Von Miller attends Spike TV's Guys Choice 2016 at Sony Pictures Studios on June 4, 2016, in Culver City, California. Von Miller has moves on and off the field. The Super Bowl MVP, fresh from signing a new six-year deal with the Denver Broncos that will pay him $114.5M with a $70M signing bonus, wants you to know he can sing and dance as well. Crooning (and to be fair, not too badly) to the tune of Justin Bieber's 'Sorry', Miller makes his case with sincerity as he sings "Start Me" while showing off moves he perhaps picked up during his recent "Dancing With the Stars" stint. "Rushing the passer and tackling dudes are some strengths of mine. Build your game strategy around me because my rating is 99," Miller sings. Yes, the man has a perfect rating in the Madden. He, along with the Patriot's Rob Gronkowski, Steelers Antonio Brown and Rams Todd Gurley, were candidates to be on the Madden cover. The honor went to Gronkowski. But could Gronk sing this well?